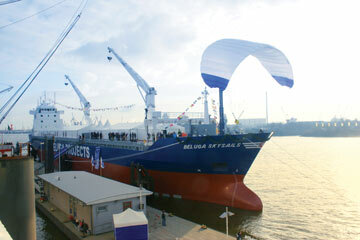 The MS Beluga SkySails was christened in Hamburg, Germany, in January. On Jan. 22, a cargo ship longer than a football field set sail from Germany to the New World, embarking on an 18,000-kilometer journey that will take it from Germany to Venezuela and on to the United States and Belgium. But unlike most commercial vessels, this ship is fitted with an enormous wing-shaped kite. When reeled into the air, the kite acts like a sail, pulling the ship along and cutting fuel consumption by as much as 35 percent. It’s the world’s largest sailboat — sort of. For the shipping industry, the technology — called the “SkySails system” — couldn’t have come at a better time. Less than three weeks after the ship was christened, oil prices hit a landmark high of $100 a barrel. By using a skysail on the MS Beluga SkySails, Beluga Shipping expects to save nearly $2,000 per day in fuel costs. But money isn’t the only factor driving the shipping industry to go green. The world’s fleet of cargo ships, fueled by refinery leftovers — black sludge that’s cheaper and thicker than crude oil — emits more carbon dioxide than the world’s fleet of airplanes. And a recent report found that their emissions, rich in sulfur and nitrogen oxide, contribute to about 60,000 deaths each year. But until recently the industry has largely escaped environmental regulation. Now that’s all changing. Increasing political pressure, increasing fuel expenses and new regulations have prompted the shipping industry to investigate energy-saving ship designs, alternative fuels and even giant sails. Harnessing the wind’s power to haul cargo across the ocean is not a new idea. The first ships to cross the Atlantic were fueled by the wind. But the shipping industry largely abandoned sails in the 19th century because steamers could carry more cargo and weren’t dependent on the fickle winds for their power. “One of the reasons we went from sail to steam is we could reduce the time of the voyage and increase the number of port calls that a ship could make in a year,” says James Corbett, a marine policy expert at the University of Delaware in Newark. The idea of using kites to help propel ships came to Stephan Wrage, an avid sailor, while he was flying a kite. “Being dragged along the beach at maximum speed,” he says, got him thinking about “alternative ways of using the immense power.” In 2001, he formed a small company called SkySails GmbH & Co. KG to develop kites large enough to pull ships. Now the first commercial sail is on the open ocean. Unlike a traditional sail, the skysail is designed to augment rather than replace the ship’s engines. It’s unusual, Corbett says, “because it does not try to cast us back to a time in which ship performance was not as good as today.” And it avoids many of the drawbacks associated with traditional sails: It doesn’t cause a ship to list and, because it flies 100 to 300 meters in the air, it can capture stronger, more stable winds. In addition, the skysail can be deployed or retracted with the push of a button and it’s small and lightweight. In fact, when folded, the skysail aboard the Beluga SkySails can fit into a space no larger than a telephone booth. The Beluga was built with a skysail already onboard, but ships can also be retrofitted with the technology. Wrage isn’t the only one building ship-towing kites. Dave Culp, an engineer based in Martinez, Calif., has his own business, a company he launched in 1996 called KiteShip. He and Wrage have the same basic idea, but the technology varies slightly. Culp says it’s only a matter of time before the kinds of sails that he and Wrage are building catch on. “We’ve gotten the cost of production so low and the benefits so high,” he says. But the innovative kites won’t benefit everyone. According to a company representative, the SkySails system isn’t meant for ships that travel faster than 16 or 17 knots because the efficiency of the system decreases as the speed of the ship increases. That means container ships, which average between 18 and 22 knots and represent the fastest-growing sector of the world’s fleet, won’t be able to use the technology. And the impact skysails will have on reducing emissions is unclear. Although ships can use the SkySails system to reduce fuel consumption, they can also use the technology to increase speed. If the ship’s captain doesn’t throttle back the engine when the sail is deployed, the ship speeds up and its cargo gets delivered faster, but the same amount of fuel is burned. “The question will be whether technologies like the skysail will be used to reduce carbon dioxide emissions from what they are or whether they will be employed to help the ships meet an increasing service speed without increasing emissions,” Corbett says. The slow-moving ships that SkySails caters to “may benefit more from an extra knot of speed,” he adds.